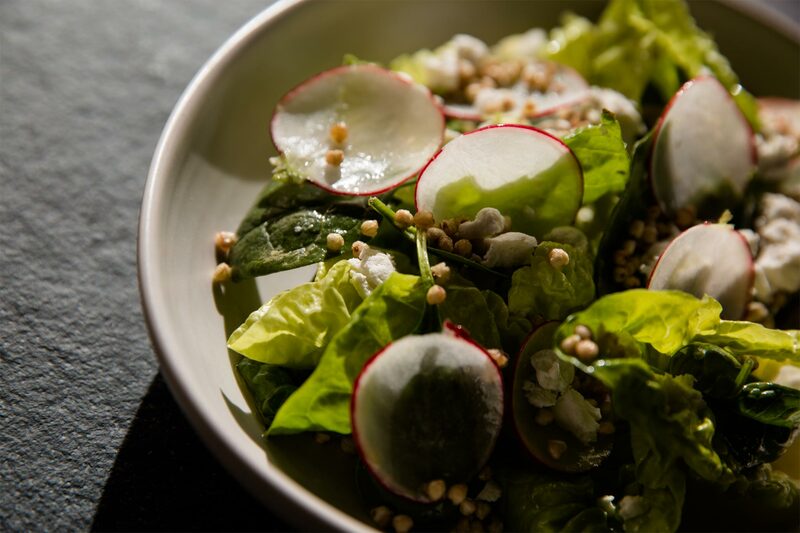 The dressing should be well seasoned so don’t over season the salad, but do be very generous with the dressing and also the crispy buckwheat, that is what makes this salad great. Blanch buckwheat for 12 -15 minutes in boiling water until cooked, dry them then deep fry and season with sea salt. To make the dressing combine all the ingredients in a bowl and whisk together, season to taste. Break the cos leaves in a bowl and add the finely sliced radishes and spinach leaves, dress with the dressing and lightly season. Place the salad in a serving bowl then sprinkle with crumbled goats cheese and the crispy buckwheat.